Keeping a garage warm, or at least warmer, is ideal when working during the winter. One of the problems with many garages is they lack a 220 volt outlet to run a heavy duty heater. 220 volts is ideal to get the high amps needed to run a commercial style electric heater. With that said there are many 120 volt garage heater that can help keep things inside a manageable comfort level. As long as the garage doesn’t have only a single breaker to run all its outlets more than one 120 volt heater can greatly improve things. How well the garage is insulated and how cold it is will obliviously have an impact on the amount of 120 volt heaters needed. The average 120/110 volt power outlets can handle between 15-20 Amps of power draw before it throws the breaker. Looking at your power box breaker will tell you the amps of each one. A single breaker will power more than one outlet and lights. Some garages will have on a single breaker managing all the outlets and lights while others will have two or more. Below are some of our favorite options with many more available. This is a Ceiling-Mounted heater is a popular option since it is mounted up out of the way. It has a nice mounting bracket that can be hung from a ceiling or even mounted on a bench. The On/Off switch is controlled by a pull string. This type of garage heater is a permanent solution and not mean to be moved around. It is a low-cost solution that works well in many garage work environments. This Craftsman unit is portable and easily carried form one spot to another. It has two settings for 750 watts or 1500 watts for 120/110 Volts AC power. Other features include a safety tip-over switch and an adjustable thermostat. Since it is portable i is handy in many scenarios. Small mobile durable and tough this Lasko model is a good portable heater for a garage, construction, or any place one is needed. It is a 120/110 Volt 1500 watt unit that has an adjustable thermostat. Propane heaters are also a good option when electric outlets are limited. They do require a door to be open while using since they burn up the oxygen in the air. Dyna-Glo makes many good propane heaters including the RMC-FA60DGD which can put out a lot of heat when needed. Having a warm garage can go a long way in helping to stay motivated when it comes to projects. No one likes to work in a cold garage in the winter. 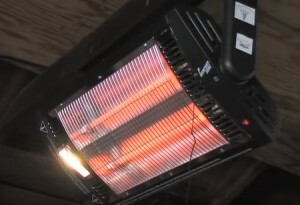 Thankfully with the many garage heaters sold there is no doubt one that will fit your scenario.